Evans, Louisa, and Andew, Neil L. (2011) Diagnosis and the management constituency of small-scale fisheries. In: Pomeroy, Robert S., and Andrew, Neil L., (eds.) 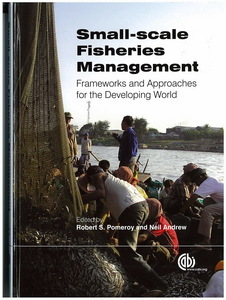 Small-scale Fisheries Management: frameworks and approaches for the developing world. Cabi, Walingford, UK, pp. 35-58. [Extract] Small-scale fisheries (SSF) provide essential services to more than 180 million people living in developing country contexts characterized by poverty and food insecurity (Delgado et al., 2003; FAO, 2004a, 2008; Pauly, 2006; Béné et al., 2007; Zeller et al., 2007). Management is widely regarded to have failed to deliver fisheries that contribute fully to economic and social development (FAO, 2003a, 2004a; Cochrane and Doulman, 2005). Small-scale fisheries present particular challenges for management in that they are diverse, in terms of participants, resources and ecosystem services, gears and contexts, and complex in their connectivity to other livelihoods, other ecological systems and across multiple scales (Berkes et al., 2001; Berkes, 2003). Small-scale fisheries are also vulnerable to drivers of change external to the fishery domain, but these factors have often been neglected in classical fisheries management (Andrew et al., 2007). Innovations in management that include wider system dynamics and enhance the ability to better cope with and adapt to both external drivers of change and internal sources of uncertainty are needed to facilitate a broader management focus.